Simple + Pretty « Stitch Design Co. This past Friday Jane Potrykus who writes the blog Simple + Pretty stopped by the studio to say hi. 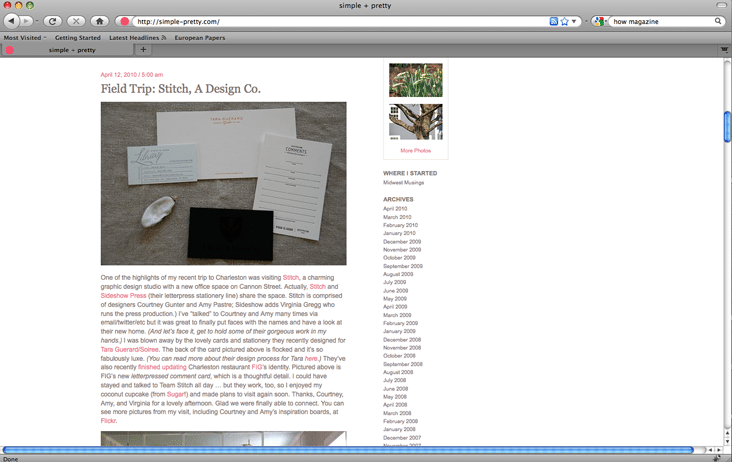 We have been long time followers of her blogs and all things Simple + Pretty. She happened to be in Charleston last week so we scheduled a get together here at 9 Cannon. Thank you Jane for stopping by! It was our pleasure to finally meet you. the pleasure was all mine. you are turning out some fantastic work + i'm glad to know you!